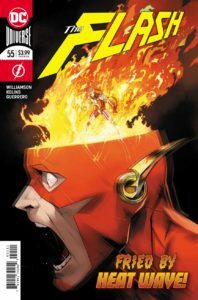 This issue of THE FLASH gives you a little bit of everything. Barry and Alexa (no, not THAT Alexa, I mean Fuerza) are fighting a weapon powered by the Sage Force. Fuerza learns more about the control of her own Strength Force. 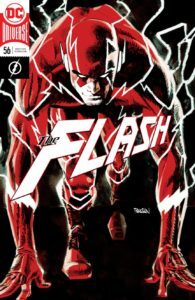 Barry brings out a little-used aspect of his own Speed Force. And, as we move to the avatar of the Sage Force itself you’ll see…wait, don’t want to spoil that here. Want to know more? Follow us after the jump! 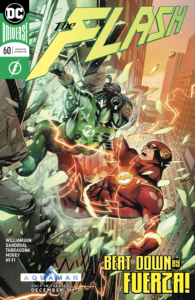 This entry was posted in Reviews and tagged Alexa, Barry Allen, Corto Maltese, Force Quest, Fuerza, Iris West, Review, Sage Force, Strength Force, The Flash on January 5, 2019 by Ed Garrett. The Sage Force has found a host in Mick Rory, aka Heat Wave, and as we left last issue it appeared that there was absolute devastation in Iron Heights. Just what is going on here? And, how can The Flash save both Heat Wave and Central City? Want to know more? Follow us after the jump! 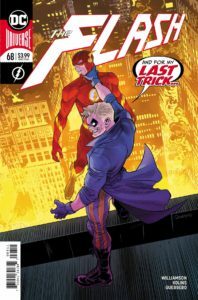 This entry was posted in Reviews and tagged Heat Wave, Review, Sage Force, The Flash on October 10, 2018 by Ed Garrett. There are plenty of guests early on in this issue of THE FLASH, but the main action comes with a very familiar Rogue. Barry has yet to go on his Force Quest, but he may be reconsidering that thought soon – as he ends up face to face with Mick Rory in a way he never imagined! Want to know more? Follow us after the jump! 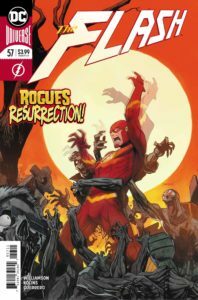 This entry was posted in Reviews and tagged Heat Wave, Justice League Dark, Review, Sage Force, Solomon Grundy, The Flash on September 27, 2018 by Ed Garrett.